We spent a night at Sprout Creek Farm recently. I’ve often bought their cheeses at the Union Square Farmers Market, but this was our first visit to this picture perfect farm that has cows, sheep, goats, hens and ducks. They make cheese from goat’s milk and cow’s milk, and I returned home with several pounds of cheese. Cheese straight from the farm tastes like no other, I discovered, on a cheese trail in Vermont. This time, amongst my treasures was a small box of ricotta cheese. I kept promising myself that it wouldn’t end up in a rich cake. Instead, I would just eat it smeared on toast with the lightest drizzle of olive oil and a shake of salt and pepper. 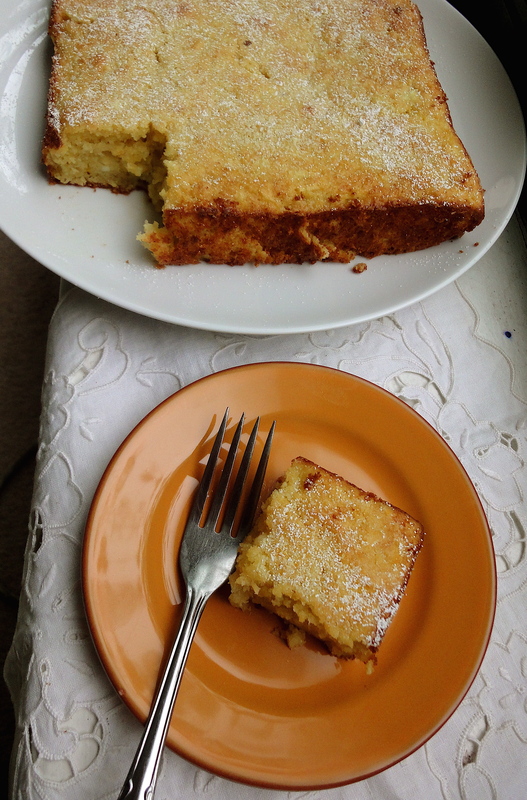 Yet a few days later, here I was, thinking longingly of Louisa’s ricotta cake along with another one that had caught my interest, Giada’s ricotta orange pound cake. When I had made Louisa’s cake earlier, I used just lemon zest for flavor as the author suggested. 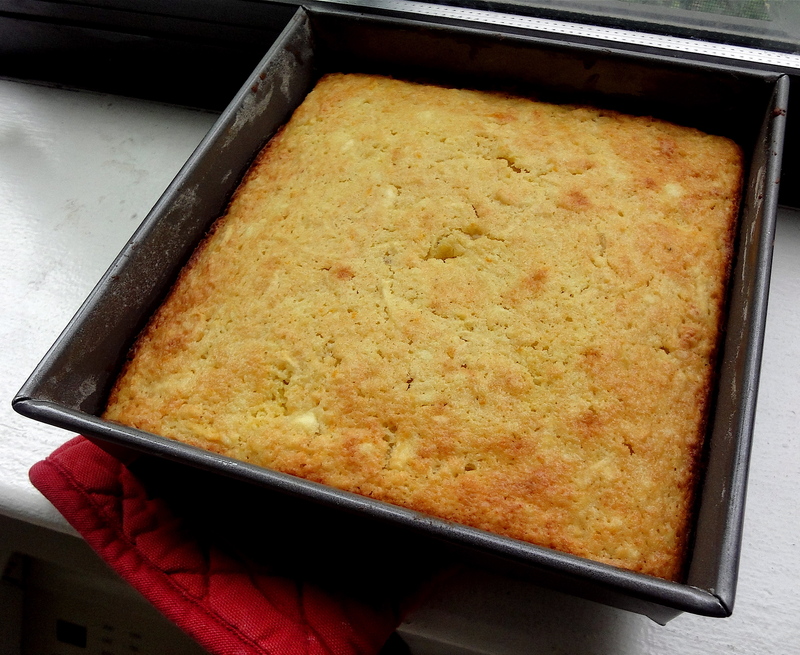 But the cake turned out a little paler and less flavorful than I would have liked. What I loved about that recipe though was its use of a cup of grated apple that melted into the cake. Giada’s cake had amaretto, vanilla and orange zest, but it was a fussier recipe that used cake flour. What would I do later with that box of cake flour, I wondered? The cake that resulted was a combination of the two. It turned out beautifully – moist and golden, with flecks of orange and a heady flavor of almond and vanilla. Note: serve the cake warm or reheat before eating. 1. Heat the oven to 400˚. Butter and flour a 9 or 10-inch pan. In a bowl, combine flour, salt and baking powder lightly with a whisk and set aside. 2. In a large bowl, cream the butter and sugar with an electric beater until light and fluffy. 3. Add the eggs slowly, one at a time. Add the amaretto and vanilla essence. Turn off the beater, and put aside. 4. Gently, with a spatula, add in the flour mixture, ricotta, apple and orange zest. Stir gently to combine. 5. Place the batter into the prepared pan, smooth the top, and bake for about 30 minutes, until the cake is golden brown. The sides will start to pull away from the pan. 6. Cool in the pan for several minutes. Turn the cake out of the pan, and cool, preferably on a wire rack. I made this cake a couple of days ago for people at work and it was a super duper hit, everyone loved it. I especially like how you have combined the best of two recipes to make your own special one. It came out moist and just simple delicious..I look forward to more recipes..